With luscious weather all year long — give or take — and gobs of sparkling pools, activities and staff to cater to your every need, you’re one-visit away from the Omni Orlando ChampionsGate becoming your family’s new all time favorite resort. From a distance, the Omni Orlando duly impresses with a palm tree-lined entrance and formal arches proclaiming “Champions Gate.” The sumptuous lobby is decked in sparkling chandeliers and miles of creamy marble floor — all overlooking a view of a lazy river, pools, golf course greens and Orlando sky. This place has it all. Well, obviously, in Central Florida they don’t have a beach, but besides that if you stand near the Omni’s pool, close your eyes and sway a little — you’ll swear you’re in Maui. 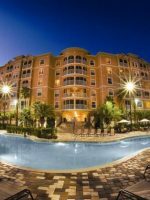 Located an easy 35-minute drive to LEGOLAND Florida in one direction and a breezy 30-minute drive to Disney World in the other, this incredible hideaway is fabulous when you need to chill. 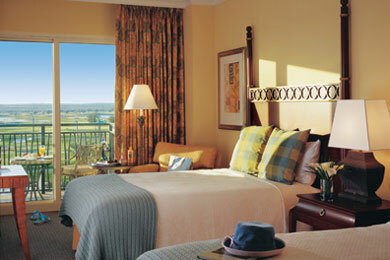 And hideaway is an apt description of the Omni Orlando. This jewel of a resort is definitely off the beaten Disney path — and good for it! — you’ll find yourself thinking. 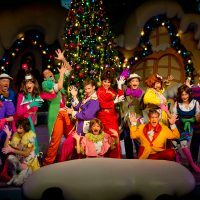 With so much hub and bub in Orlando you can easily end your trip needing a vacation from your vacation. Not so at the Omni Orlando. Let’s start with the Omni’s pools. There’s a lot of them. You’ll find a beautiful zero-entry family pool with it’s own water slide. 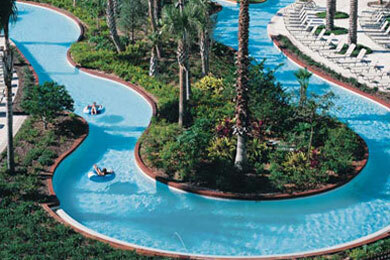 Immediately next to it is the 850-foot foliage-laced lazy river — a magnet for kids and adults alike. Nearby are two whirlpools and an elegant quiet pool flanked by spiffy cabanas for weary adults. Need more? The Omni has 36 holes of championship golf, tennis, walking paths, a gleaming fitness room and a European spa. Kids receive a backpack brimming with toys upon arrival and milk and cookies delivered to the room on the first night. Camp Omni Kids Escape offers an active kids’ club every evening so adults can get away and play. But the Omni had us at their luxury villas. These two- and three-bedroom marvels stun with Pottery Barn-like decor, full kitchens, garden tubs and a washer/dryer combo. For those preferring a traditional stay, the Omni also offers lovely guestrooms (with refrigerators) and several full-course and casual dining spots. The Omni Orlando is broken down into one main 16-story hotel with villas off to the side. The Omni has two- and three-bedroom villas with complete kitchens and a stacked washer/dryer available at friendly prices. Picture it: a full kitchen in these villas equals no expensive dining bills, and everything you need to keep your eating-machines in calories (and you in caffeine) is here, including pots, blenders, knives, an oven, a coffee machine, a dishwasher and more. But the greatest sight to a traveling parent? A stacked washer/dryer! No coins required. Each bedroom gets a bathroom. 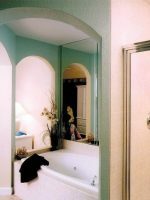 The master bath has a garden tub and a separate, large shower. Every room has a huge flat-screen TV, so four TVs in a two-bedroom villa. The dining room is huge, and a small den off the foyer offers privacy. The villas also enjoy their very own dedicated concierge (who seemed disappointed that we didn't give him a task), quiet pool and health room (small, but impressive). The villas also have their own parking, relieving you of long schleps to the car with luggage. If cooking on vacation sounds counter-intuitive, the Omni Orlando's main hotel wing offers eight room styles including the budget-friendly deluxe rooms, the family-friendly studio suites and the everyone-friendly Presidential suite, delivering lots of square footage. The nicest staff I have ever met, from the moment you arrive the valets are there to answer any questions, the bellmen give you all the info. Then when you get to requesting service everyone and I mean every one will want to accommodate and make you happy. If you are a golfer, this would be a great place to stay fantastic course and if you want to improve you game they have a Leadbedder golf academy. We went because my wife was in a Triathlon Ironman 70.3. She loved it because they where so accommodating to her needs and made the trip enjoyable. She even wants to go back and spend time after the race. 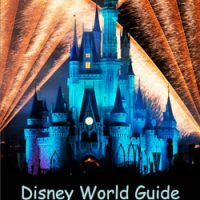 If you are into Disney they offer transportation to and from the hotel to the park. 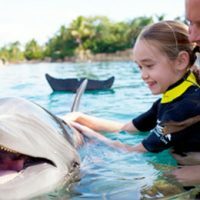 We love this resort and I love my Omni rewards. Love the lazy river and the grounds are beautiful. Love the adult pool and it’s service staff are attentive. Restaurants mostly very good. Sometimes great but this time Zen suffered. Maybe will be better next time. The Omni's 850-foot lazy river looks almost authentic to the actual Amazon river. Kids will remain planted in the Omni's complimentary inner tubes for hours. The zero-entry family pool (5 feet, 9 inches at it's deepest) has a corkscrew water slide and an interactive, shallow pool has it's own towering fountain. Best of all, the Omni isn't stingy with the pool hours. Kids can stay immersed until 10 p.m. every night. 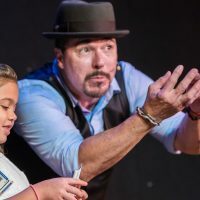 Offering kid-friendly dinners, movies, video games, board games and other activities, the Camp Omni Kids Escape program gives parents time to escape. The program is open nightly from 5 to 10 p.m. and welcomes children ages 4 to 12 years. The price includes dinner. Reservations required. All of the family favorites are here including air hockey, driving games and and Mrs. Pac-Man. It's located near the pool and immediately next to Camp Omni, and open an amazing 24-hours a day. Are you or the kids beginners at golf? The Omni has an ideal course for the whole family on the nine-hole, par-three Champions 9 course. It's even beautifully illuminated for evening play. Junior rates are also available on the two 18-hole courses. Check in at the pool towel hut up until 8:30 p.m.
Tennis, basketball and volleyball lovers will find their courts at the Omni. The resort has two lighted tennis courts, a lit basketball court and a sand volleyball pit. Equipment can be checked out at no charge from the pool towel hut from 8 a.m. until 11 p.m. Located on the ground floor in the Omni Orlando, Broadway Deli is a great place to grab quick sandwiches and salads in the cold case and crackers, candy, chips and fruit on the shelves. Nice wine selection too. Located inside the golf clubhouse, Piper's Grille is open sunrise to sunset with a bag player playing most evenings at sunset. The menu includes salads and large sandwiches for breakfast and lunch. 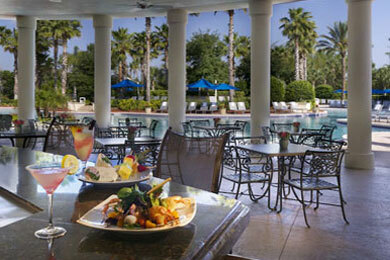 Located poolside, Croc's is a relaxing spot shouldering the family pool and offering small plates and cocktails. Neat view of the pools and fountains screams vacation. Opens at 11 a.m. daily in nice weather. This dark wood sports bar and grill boasts wall-to-wall sports with a pool table, Foosball, darts and several flat screened TVs tuned to the latest game. The rather large menu serves steaks, crab cakes, an impressive wine list and cocktail selection. A cigar menu is also on hand. Relaxed atmosphere. Located on the lobby floor. Open at 4 p.m.
Morsels is a wonderful place to stop for your Starbucks-and-scone fix. Opens at 6 a.m. Located on the lobby level. Located on the ground floor, this pretty restaurant with wicker and cane chairs, generous clam-shell booths and draping curtains serves up a great breakfast, lunch and dinner. We were impressed with the brunch including an omelet bar, a cereal bar, a pastry bar, a fruit area and a lot more. Little orchid blooms sit in the middle of the cheese and meat trays, and the pastries were as delicious as they looked. Italian dinner choices include ravioli, gnocchi and flat-bread pizzas -- all flavored with herbs grown in the Omni's own Italian herb garden. In nice weather, ask to sit on the beautiful patio. Or if it's indoor-weather ask for a large clam-shell booth. Kids will love it. Open for breakfast and lunch from 6:30 a.m. to 2 p.m.; Dinner is served from 5 to 10 p.m. Families will love the sushi and Pan-Asian dishes at this authentic Chinese restaurant. The wonders you love are all here: sweet and sour pork, orange sesame beef, General Tao's Chicken and more. Choose between a la carte and the Zen Experience. All presented within a quiet, upscale atmosphere. Located on the lobby level. Room service offers a full menu available 24-hours a day with a kid's section. The Lobby Bar is located in the Omni's graceful, but modern lobby. It's a casual and relaxed spot to enjoy a glass of wine. Opens at 5 p.m. The Omni's business center, open 24-hours a day, enjoys a great lobby location and is stocked with computers, printers and copiers -- all credit card automated. Laundry service is available and a stacked washer/dryer is in each villa. No coin wash is available. 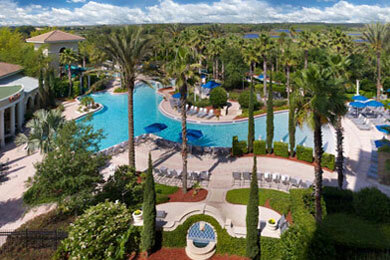 A small resort fee covers Wi-Fi, newspapers, shuttles to Disney theme parks and in-room coffee. Parking is additional. Bring bug spray and no-itch cream. Sunblock all year round and compact umbrellas during the rainy season are musts. The Omni's fitness room rocks. To begin, two of the walls are almost nothing but windows. (Love that bright, airy feeling.) You'll also find little packages of earplugs, TV's on the cardio-machines and both free and machine weights. If you need to be under blue sky, head to the well-maintained 1.5- or .4-mile walking paths. Open 24-hours. March through August means roasting temps with the rainy season starting at the end of April. Thunderstorms begin in May. There are fewer thunderstorms in September, but it's still rather humid. October and November can be lovely with mild temps and very little rain. December though February can go from cool to really cold so continually check the national weather forecast before you travel. 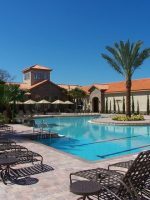 August through October and the first two weeks of December are the quiet seasons for the Omni Orlando. Catering to both group business and leisure travelers, January through June are the Omni's busy months. 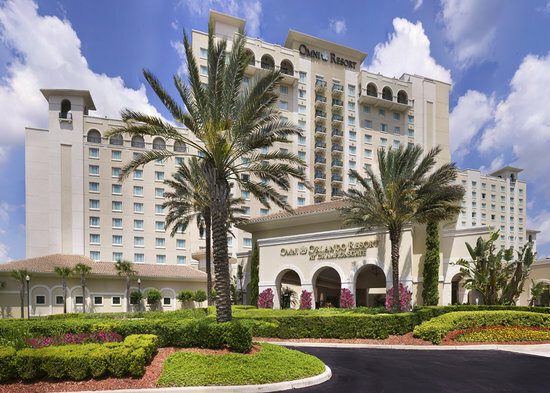 The Orlando International Airport is an easy 30-minute drive to the Omni Orlando with a toll fee along the route. The Tampa International Airport is a 75-minute drive to the Omni, also with tolls. Included in the resort fee is a scheduled shuttle to Walt Disney Theme Parks. Reservations are required. The Omni Orlando's spa offers separate steam rooms for mom and dad, a whirlpool and a menu brimming with hot oil scalp massages, deep cleansing facials, sweet almond cream pedis and a lot more. There's also a couple's treatment room if a Swedish spa for two sounds intriguing. 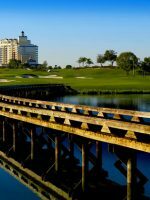 The Omni Orlando features two championship 18-hole golf courses designed by architect and golfer, Greg Norman, a lit 9-hole, par-3 golf course, and is the world headquarters for the David Leadbetter Golf Academy -- a premiere golf instruction facility. Golfers will love proximity of the golf course to guestrooms (literally a walkout) and the continuous golf cart shuttle to and from the golf course and academy. The 36 holes blend traditional and modern elements. The International Course offers an experience reminiscent of the courses in the British Isles, and the National Course offers golfers a more traditional American-style design.